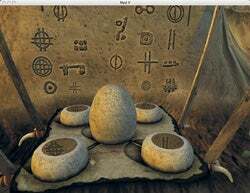 Myst V: End of Ages marks the end of the road for one of the most beloved adventure games of the modern era. The Myst series, created by Cyan, started life on the Mac, so it’s only fitting that it reaches its end here, too. This final chapter in the Myst series has much in common with the earlier games: you must help restore the empire of the D’ni, a civilization of people who met with catastrophe. Of course, solving puzzles is what Myst V is all about. As in past games, many of the puzzles involve moving letters or other apparatuses to see how they affect something much larger than you. This game introduces slates , stone tablets that can be used to communicate with the Bahro, mysterious and elusive creatures you’ll meet throughout Myst V. To use the slates, you draw primitive symbols you find on your adventures (pictured below) and then lay the tablets in plain sight so the creatures can see what you’ve written. If you’ve drawn the symbols correctly, the creatures will carry out your orders. Myst V is the most technically sophisticated game in the series, employing a real-time environment, gorgeous graphical effects, a stunning soundtrack, and mind-blowing attention to detail, right down to the leaves on the trees and the blades of grass in the fields. Whereas previous versions of Myst let you interact with live actors who were composited into 3-D environments—a sometimes disjointed affair—Myst V maps the actors’ faces onto 3-D characters. The net effect is uncanny—the characters aren’t entirely lifelike, but are much better integrated into the game. To play, you’ll need at least a 1GHz G4 with a 32MB video system. However, Ubisoft recommends a 1.6GHz or faster processor to keep up. Mac players will need to buy the game on a hybrid Special Edition DVD, which, at $60, costs $10 more than the Standard Edition CD that shipped for the PC. But it includes extras such as a soundtrack, a documentary about the game, and a strategy guide—a handy addition for the mere mortals among us who may get stuck trying to unravel some of Myst V’s challenging puzzles. Myst’s final chapter is a beautiful, challenging, and fitting close to this historic series. PROS: Beautifully produced; challenging puzzles; multiple navigation modes. CONS: Puzzles are occasionally frustrating; Mac players can use only the more expensive Limited Edition.